Aside from selecting most qualified physician available to you, nothing is more important that fully understanding and implementing post hair replacement surgery care. Immediently after having the surgery, you will most likely have a compression bandage around your head- although this varies according to the physician you chose. There are two different approaches doctor’s take to the post-surgery bandages. Sometimes patient’s are allowed to go home to rest for the night, and then asked to come back within the next few days in order to have the bandage removed. At this time the clinic will also examine the scalp to ensure the grafts are in fact taking. Other times, the patient will have the bandage removed several hours after the surgery and be sent home without one. Neither way is better than the other, it all just depends on the physicians preferences. It is extremely critical to ensure that you are very gentle with the new hair grafts in the first couple of days because, although it is a rare occurrence for one to actually fall out, this is the time that it is most likely to happen. If one does fall out at home, do your best to keep it moist until you can return to the clinic to see if they can replace it. Saline is the recommended solution to soak a fallen graft in. For the first day, avoid touching the scalp entirely. This means no washing it in the shower, and ideally, avoiding contact with your pillow at night. Don’t worry; the doctor will clean your scalp when you go in for your appointement one day post-operation. A lot of people choose to sleep upright in a recliner post surgery. After three days, most doctors will allow gentle shampooing of the scalp. Since permanent sutures are most commonly used to close the wounds after taking the grafts, the majority of patients have to return to either the transplant clinic or their own personal doctor to have them removed after about ten days. Depending on the hair transplant clinic used, they will then either instruct you to use saline or Vitamin E to keep the crusts around the grafts moist. As long as they are continually moistened, they will separate easily from the grafts. There are also various shampoos and conditioners that are meant to be used post-hair replacement surgery. They have been specifically formulated to be mild on the scalp, and some can even minimize the scars from surgery. There are also special gauzes that are saturated in copper peptide to help stimulate new hair growth. Copper peptide also helps restore the skin as well as curtail the amount of crusting that you will experience . It’s imperative that you discuss the different options available to you post-operation with your surgeon to decide which treatments would be best for you. One of the most important aspects of post hair replacement surgery care is to remember not to stress! The hair growth is expected to appear patchy at first, and it’s very possible some of the natural hair from before surgery will also fall out. The key is to remain patient- especially if there are multiple sessions scheduled over the course of the next couple of years. 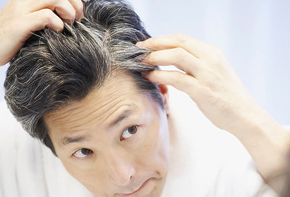 There should be visible new hair growth after about three months post session, and it can take all the way up to nine months before you will be able to fully tell if the surgery was a success. After about a year post-surgery, the transplanted hair should begin to grow in just like the rest of the hair on your head.